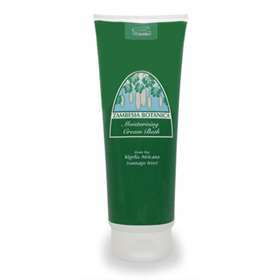 Zambesia Cream Bath is specially formulated to moisturise and is suitable for use in the bath or shower. Can be used by people who may be prone to Dermatitis, Urticaria, Eczema, Psoriasis. Leaves skin feeling smooth and silky. May also be suitable for pets. Ingredients used are of non animal origin. Apply direct to wet skin. Aqua, Kigelia Africana, Sodium Laureth Sulfate, Cocamide DEA, Cocamidopropyl Betaine, PEG-7 Glycerol Cocoate, Sodium Chloride, Glycol Stearate, Cocamide MEA, Laureth-10, Citric Acidem Phenoxy Ethanol, Methylparaben, Ethylyparaben, Propylparaben, Buythlparaben, Disodium EDTA.